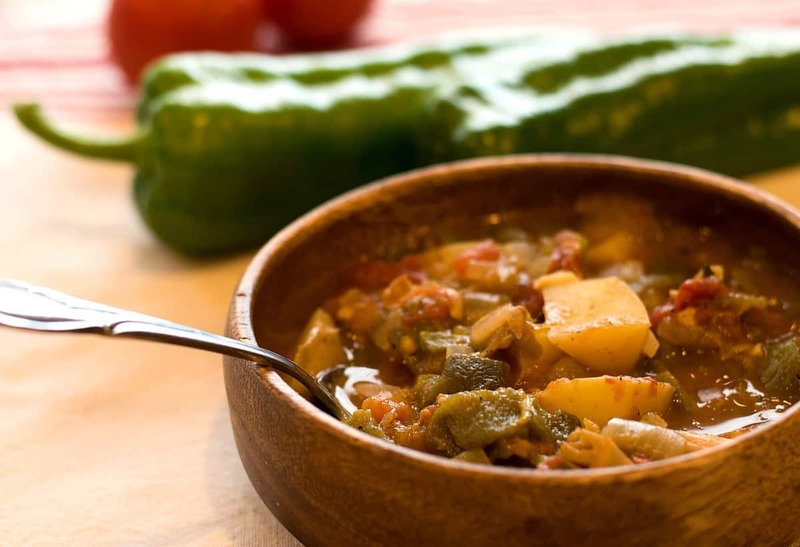 I am a bonafide New Mexico Green Chile addict…. (hey don’t judge…I DID live there for 10 years, waddya expect?) And one of my FAVORITE ways to enjoy these tasty little morsels, is by making my Vegan Green Chile Stew. 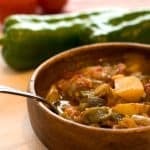 This Vegan Green Chile Stew has ALL my favorite veggies..
And all swimming in a tasty Green Chile Broth…. I know, it’s still hotter n heck in some places, but as they say on TV….WINTER IS COMING, and soon you’re gonna WANT a big ole bowl of this to warm you up! Now don’t be afraid, it’s not THAT spicy (although it can be)….. it just depends on the variety of chile you buy. If it’s HATCH Green Chile from New Mexico….look for the MILD to MEDIUM. You braver souls who know what you’re doing can venture on to the HOT or XTRA-HOT. Note: If you buy your peppers from your grocery store, you’ll want to ROAST your Green Chiles first… which means just blacken the outer skin, and them seal them in a paper bag to steam…. so that burned outer skin slides off easily. You can use your gas stove, or a grill to do this at home. In New Mexico, they are thrown in a giant rotating cage by the bushel, with a gas burner underneath to do the work, and oh my…..the smell is HEAVENLY. Here in Oregon, I buy mine at Whole Foods – and they come already roasted and packaged – super convenient. Of course you can always buy those little cans you see in the store….where the heat AND the flavor are super lame mild. But you should be able to find the real deal if you look around, because late August (now) is Chile Season. Word of warning before we get going….. if you’re new to chiles…..before handling any you might just want to take a look at THIS ARTICLE from The Kitchn…. I accidentally rubbed my eyes once after handling chilies and let’s just say it wasn’t pretty…..keep those hands washed or wear gloves. Don’t say I didn’t warn you. Again, don’t worry. They are SO totally worth the precaution and effort. Super healthy with a ton of Vitamin C and OHHH SOOOO TASTY! Dice 1 yellow onion and 1 green bell pepper, and lightly sauté until softened. Use a tablespoon or 2 of veg broth or water to keep from sticking. Add 3-4 cloves of minced garlic and sauté for another minute or until fragrant. There are many ‘meat substitutes‘ you could add at this point, or …. you can skip this step and make it all veggie. I added a 10oz package of Upton’s Naturals Chili Lime Jackfruit. Here’s an AMAZON LINK so you can see what it looks like. Remember this is an affiliate link, meaning if you buy any, I’ll make a penny or two. They are 100% oil-free and vegan. Or, you could add an 8oz package of sliced Portobello Mushrooms, or Seitan, or maybe a cup of my Cauliflower Taco Meat. Up to you….but the Jackfruit was very good. Reminds me of shredded pork which is typical of a traditional Green Chile Stew. Stir the veggies (and meat sub if using) until heated through and then add a 15oz can of Fire Roasted Tomatoes. Now add 2 cups of Low Sodium Vegetable Broth, 1 cup of water, our diced potato, ½ tsp Cumin, ½ tsp Mexican Oregano, and ¼ tsp Salt. Stir to combine. Lastly, let’s add our Green Chile. I shoot for 2-3 cups of roasted, cleaned, deseeded, chopped Green Chile. If it’s super mild – go for 3 cups. Kind of hot? Just add 2. And if it IS hot, you can optionally add one of those little 4oz cans of store-bought mild Green Chile to make up the difference. Give that a good stir and let it simmer for 15-20 minutes. Masa Harina is corn flour used to make Tamales. I sprinkle a tablespoon of this on top to help thicken my stew. You can use regular flour or even cornstarch if you can’t find Masa. Perfect. Serve with chopped green onions and diced avocado for garnishments, and corn tortillas for dipping. 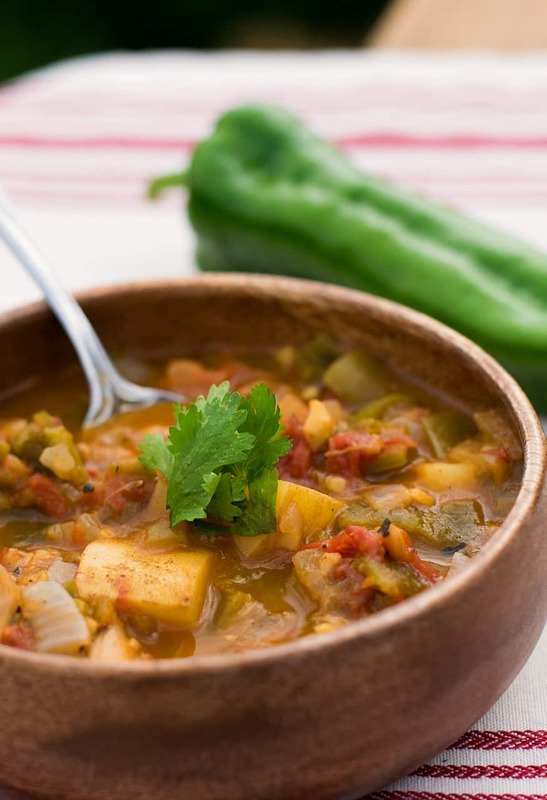 This Vegan Green Chile Stew is so rich and flavorful - it truly captures the heart of New Mexico. Fresh Hatch Green Chiles really make this dish pop. Saute diced onion and bell pepper until softened. Use 1-2 Tbs Broth or Water to keep from sticking. Add garlic and continue sautéing until fragrant - about 1 minute. Add jackfruit or other meat substitute and simmer until heated through. Add tomatoes and stir to incorporate. Add broth, water, potato, and spices. Stir to mix well and simmer until potatoes are cooked through. Add 2-3 cups of roasted, cleaned, chopped, Hatch Green Chiles. Adjust to your own taste. (Use a 4oz can of Green Chiles instead of fresh if you do not like spicy foods). Bring to a low boil and add Masa or Flour to thicken. Reduce heat and simmer for an additional 10-15 minutes. I’ve made this a couple of times now. Thank you for this recipe! i always loved green chile stew,but now that I am vegan, I can’t just get it anywhere. I love yours! I am planning to make this for the Super Bowl. In the description you mention chunks of potatoes but the list of ingredients does not include potatoes. Do you add potatoes? If yes, what type,and at what point in the preparation? Looking forward to trying this. Thanks for the recipe! In your write up you mention potatoes, but I don’t see any potatoes in the ingredient list or instructions.